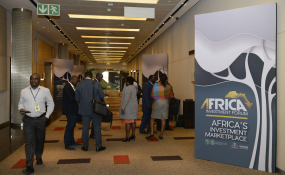 Johannesburg — The Overseas Private Investment Corporation (OPIC), the U.S. Government’s development finance institution, and Africell Holdings Limited today signed a commitment letter for $100 million to expand access to telecommunications in Africa. The project is expected to have a highly developmental impact particularly in Uganda and the Democratic Republic of the Congo by expanding the availability and quality of affordable mobile telephone and internet services in these countries. OPIC Managing Director for Africa Worku Gachou and Africell Chief Investment Officer Ian Paterson signed the commitment. Africell was established in 2001 and is one of the fastest-growing mobile telecommunications operators in Africa with a focus and skillset tailored for operations in frontier markets. Africell has established itself as the market leading operator in The Gambia and in Sierra Leone and is rapidly growing operations in the Democratic Republic of the Congo and Uganda. Today, Africell’s total number of active subscribers is greater than 12 million. Copyright © 2018 Overseas Private Investment Corporation. All rights reserved. Distributed by AllAfrica Global Media (allAfrica.com). To contact the copyright holder directly for corrections — or for permission to republish or make other authorized use of this material, click here.